Soloists of the Canadian Brass: Brahms & Mozart for Horn Trio with a world premiere! Opening Day Records proudly inaugurates a new imprint of its impressive catalogue, Soloists of Canadian Brass, with a new recording of Horn Trios featuring virtuoso hornist Jeff Nelsen, joined by veteran violinist Ik-Hwan Bae and new piano sensation Naomi Kudo. These are intimate and beautiful readings of two well-loved masterpieces of the chamber music repertoire featuring French horn: the Brahms Trio, Op.40, and a world premiere adaptation of the Mozart Horn Quintet for Horn Trio by Tony Rickard. Opening Day Records, headed by Canadian Brass founding member and tuba player Chuck Daellenbach, features a rich variety of great Canadian artists, showcasing the same musical range and quality that has made Canadian Brass famous for the last 40 years. With the Soloists of the Canadian Brass imprint, there is now a home for the solo and chamber projects of current and former Brass virtuosi, from Ronald Romm to Ryan Anthony to Brandon Ridenour. 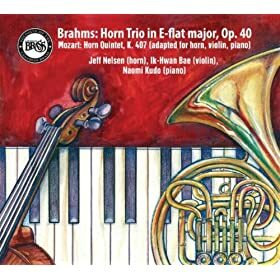 Weaving a tapestry of colors and moods, the Brahms Horn Trio has become a proving ground for great horn players. Written after his mother’s death, Brahms combines gentle melancholy and remembrance with, in the faster passages, joyous scenes of the hunt. The world premiere recording of a new arrangement of Mozart’s Horn Quintet, K.407, for Horn Trio, is Mozart at his most delightful, aligning beauty and balance with melody and humor, along with a horn part of great virtuosity and sensitivity.